For seven seasons the appeal of the Gilmore Girls has transcended genders and generations with its signature banter and irresistibly quirky characters. Now Coffee at Luke’s raises a mug to the citizens of Stars Hollow, animatedly debating and discussing the show in true Gilmore fashion. The quirky world of Stars Hollow and the incredible relationship of the Gilmore Girls—mother Lorelai and daughter Rory are best friends—continues to engage viewers after seven seasons, with its lightning-fast dialogue, dry wit, and unusual take on family relations. In this satirical yet sensitive collection of essays, leading writers weigh in on how this unique show has successfully broken the teenage-sitcom mold and gained viewers of all ages. Addressing questions such as What are the risks of having your mother be your best friend? How is Gilmore Girls anti-family, at least in the traditional sense? and What’s a male viewer to do when he finds both mother and daughter attractive? this anthology also looks at how the characters are shaped by the pop culture they consume and how prevalent a feeling of class consciousness is within the series. For seven seasons Gilmore Girls‘s appeal has transcended genders and generations with its signature banter and irresistibly quirky characters. 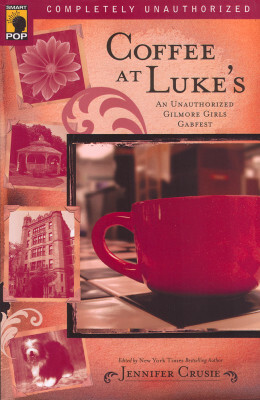 NowCoffee at Luke’s raises a mug to the citizens of Stars Hollow, animatedly debating and discussing the show in true Gilmore fashion. This is the best place to find out about published works by Jennifer Crusie, the New York Times, USA Today, and Publisher’s Weekly bestselling author of twenty novels, one book of literary criticism, miscellaneous articles, essays, novellas, and short stories, and the editor of three essay anthologies. The Jenny Crusie Shop is now closed. Thank you to all the wonderful Crusie fans that helped us raise money for charity over the last two years while also getting books into hands of happy readers! All content © Jenny Crusie and Argh Ink LLC. All rights reserved. No part of this webpage may be used or reproduced in any manner whatsoever without written permission except in the case of brief quotations embodied in critical articles and reviews.